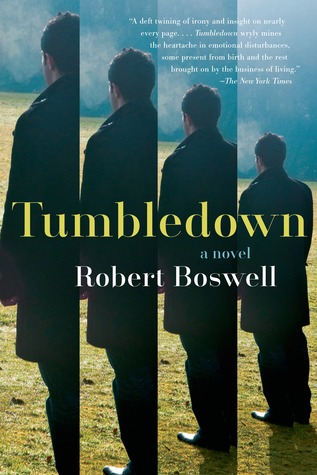 Tumbledown by Robert Boswell largely takes place at the Onyx Springs Rehabilitation and Therapeutic Center, a residential facility where James Candler is a counselor. Through the novel we meet the individual patients James works with, the other counselors, his boss, his sister and his best friend. The novel is an ensemble piece of fiction in that almost every character has an equal voice but Candler is the linchpin and where everything begins. Boswell explores the emotional makeup and backstory of this full and varied cast making for a novel replete with drama. This insight is not far from Candler’s own opinion of himself but instead of pulling back, his judgment becomes even more impaired, extending to racing a Mustang on a morning rush-hour freeway and deciding his unemployed best friend, Billy, would be a good manager of the work group. The Mustang crashes with no injuries, Candler drives on and Billy is good with the group right up until he decides to marry Karly, who happens to be stunningly beautiful but with the mental and emotional levels of a preteen girl. Tumbledown is ambitious in its scope and even its format. In the opening chapter the focus switches by paragraph between a birds eye view of Candler’s life and that of Lise Raye—a patient he saw once in another city years ago, who has followed him and is now patterning her life in such a way that they will meet. Basically, a stalker. It also shifts from the present to the past at the same time, making it difficult to get a grip on where the importance lies in the story. After this chapter Tumbledown falls into more traditional lines but then a quarter of the way through in Part Two Boswell changes from chapters to days to cover the narrative for two weeks. The purpose of this device is not clear as it does not apply brevity to the narrative nor is it repeated in the remaining four parts. These narrative changes make the novel one that that needs to be digested carefully but in the final pages Boswell goes even further by intermixing alternate endings that change with the paragraph. Unusual formatting choices aside, Tumbledown is a wry look at the challenges of life itself for everyone from the approaching middle-age crowd, to the strivers, the young, and the lonely and foolish. Boswell makes the characters sparkle in their oddities, humor and pain, making the extra layers and flourishes feel extraneous. Their humanity is enough.